Another high-end digital compact with interchangeable lenses (CX-mount as opposed to DX and FX for Nikon DSLRs), the Nikon 1 V2 has been extensively revised with respect to the V1 so as to respond to the needs of the passionate photographers for whom it is intended. According to Nikon, speed is the compact hybrid’s trump card, and indeed, speed seems to be at the heart of the 1 V2’s operation with a new 1-inch, 14.2-megapixel CMOS sensor endowed with high-speed data transfer and a new EXPEED 3a processor. The Nikon 1 V2 can shoot photos in bursts of 15 i/s with continuous autofocus subject tracking, and up to 60 i/s without tracking. The camera can “digest” 850 megapixels per second. The 1 V2 can also shoot video at full resolution: in addition to Full HD video in 60p (versus 60i for the Nikon 1 V1) in slow motion, it provides up to 400 i/s at 640×240 pixels and 1200 i/s at 320×120 pixels. The Nikon 1 V1 turned in honorable DxOMark test scores for color depth and dynamic range at its lowest ISO. Even so, that camera was penalized by the size of its sensor in terms of low-light sensitivity. The 1 V2’s new sensor varies between 160 and 6400 ISO, and Nikon was quick to claim that this increase in sensitivity enables burst shooting even in low-light conditions. The results of the latest hybrids, such as the Olympus OM-D EM-5, and slightly less so for the Panasonic G5, showed significant progress… our tests will show if Nikon has been able to follow suit. As for autofocus, it’s the same AF hybrid we discovered last year on the Nikon 1 J1 and V1. It consists of 73-zone phase detection system complemented by a 135-zone contrast detection system. 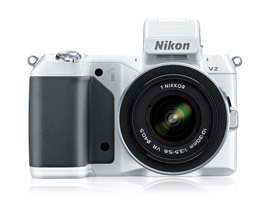 The Nikon 1 V2’s ergonomics have been revised with respect to the V1. The 1 V2 provides direct access to the PSAM modes on the main dial. The most frequently-used settings, such as sensitivity or white balance, now operate by pressing the function key and then adjusting the settings dial. The Nikon V2’s viewfinder is the same as the Nikon V1’s: 1.44 million-point EVF and 3-inch, 921,000-point screen. Creative modes are the pride of Nikon, so naturally the 1 V2 benefits from several improvements and new features, including the Best Moments Capture Mode. This new mode consists of combining the Smart Photo Selector mode with the new Slow View mode in which the Nikon 1 V2 lets you buffer up to nearly 40 frames per second of a scene and then replays them in slow motion on your display so you can pick the best photo. The Smart Photo Selector can capture 20 images at full resolution before and after the exact moment of shooting, and also provides a Motion Snapshot mode in which shots can now be recorded as three separate files: high-resolution photo, slow-motion video, and audio. Return to sanity! Note the PASM modes on the V2’s mode selection ring. The Nikon 1 V2 with the Nikkor 10-30mm lens will be available in late November 2012 for the suggested retail price of $899.95. Photographers can top off this panoply with a Nikon GP-N100 GPS module or a Nikon WU-1b Wi-Fi transmitter.